With Obama failed to effectively confront ISIS — in Syria, in Iraq, and now even in U.S. cities — millions of Americans are awakening to the need to pay close personal attention. The former Obama administration and the mainstream media never provided more than a fraction of the insight and insider analysis you need to be a fully informed citizen. 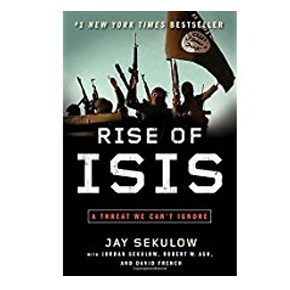 Rise of ISIS is a New York Times best-seller by legal expert Jay Sekulow, chief counsel for the American Center for Law and Justice. In this must-read blockbuster, Sekulow makes the case that America faces its greatest threat since 9/11. He warns that until ISIS is defeated, we face the risk of genocide of historic proportions. The book lays out the background that provides the ideological underpinning of the ISIS “4T” philosophy: territory, terror, troops and totalitarian Islam. Territory: ISIS already controls large swaths of Syria and Iraq, and has established its capital in the sixth largest city in Syria, where 220,000 citizens are living under extreme and oppressive Shariah law. ISIS seemingly takes over more cities almost weekly. And by all appearances, they may be gaining a quiet foothold in U.S. cities as well. Terror: ISIS is using its illicit cash flow from black market oil to build weapons of mass destruction, as well as spreading terror through videotaped beheadings of Americans and Christians. Troops: ISIS is recruiting sleeper terrorists in the U.S. and Europe. The threat in the West is so great the Pentagon has advised U.S. military personnel to take extreme precautions about protecting their personal information on social media. Totalitarian Islam: ISIS has proclaimed the universal caliphate, but for those unfortunates caught within territory ISIS currently controls, it’s a hell on Earth, where non-Muslims must convert or die.